I recommend all Dr. Seuss to help new readers enjoy reading and build fluency. The clever silly words, rhyme and repetition are all the more powerful when students can hear them and repeat them. Dr. Seuss has helped so many readers enjoy the sound and rhtyhm of our language. 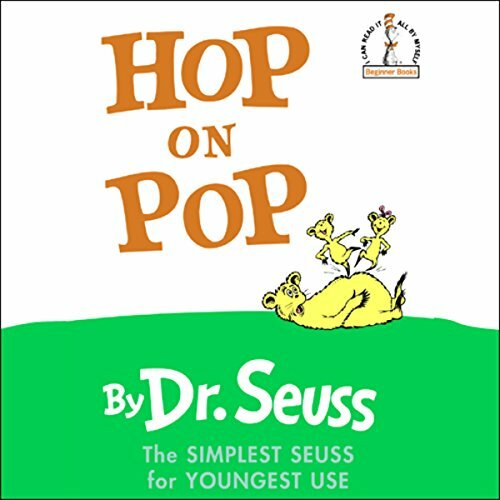 Hop on Pop is a particularly good starting place for kids as it's language is simple to master. This is as good as it gets :) David HP + good sound makes it much more tolerable. I knew there were no images with this audio when I purchased it, but I was expecting first rate audio to make up for it. The audience is younger children, right? So captivating audio is a must! The narration is very dry and unimaginative. And the music played between lines sounds like it was produced on a cheap Casio keyboard from the 80's. What would have made Hop on Pop better? Highlighting the words as they are read. What character would you cut from Hop on Pop? This book is cheaper as an app. AND it is highly more interactive.